Our nifty 19 seater takes us over stunning aqua blue seas from Malé and right up to the jetty of the Movenpick, where the staff are assembled to wave in the new arrivals. The resort that has only been open a month when we arrive, but lives up to the brand’s reputation for luxury as soon as we sink our feet into the sand. 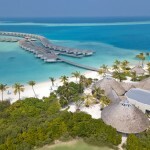 The once-inhabited island was recently purchased exclusively for the resort, which is an artfully designed mix of beach spa pool residencies, beach pool suites and overwater water villas on stilts. 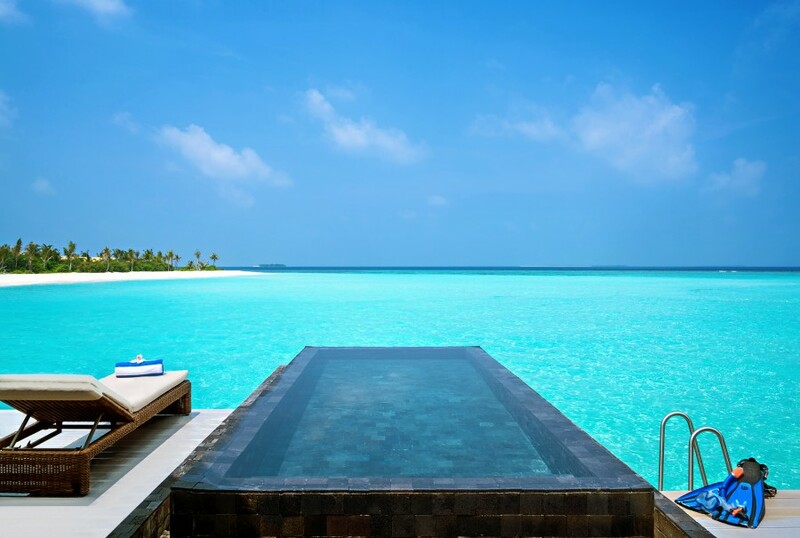 We are fortunate enough to be staying in an Overwater Pool Villa Ocean, which looks out into the sea for complete privacy. It’s one of those suites that takes your breath away, however well travelled you are. 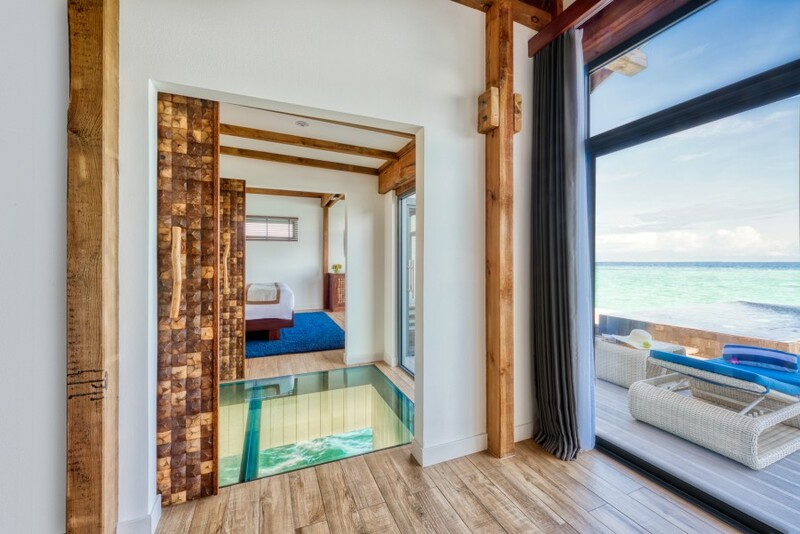 On entering, you walk through long glass walkway which overlooks the fishes below. Take a left through coconut sliding doors and you’re in an enormous bathroom with high ceilings and a stand-alone bath overlooking the sea. There are two sinks with two-sided mirrors and a shower that opens out onto the water. You could camp out here for a while, but should sleep call, there’s a large bedroom and living area through the doors on the right. This opens out onto a large private terrace, with an infinity pool, sun loungers, a hammock, an outdoor shower and steps down to the sea. This, my friends, is living the dream. The entire resort has an eco-sensibility: it was designed by architects from the Poland based company MOTIV in harmony with the environment, with an eye for functionality as well as aesthetics. There are three restaurants: ONU Marché, Latitude 5.5, which serves international grills for lunch and dinner in a fairly casual setting, and the more formal Bodumas. We sit outside Bodumas under the stars on our first night, where the head chef has prepared us a series of surprise dishes. Highlights include a spicy tuna dish, excellent scallops, tender beef and a cheesecake so light and fragrant you could almost imagine it to be healthy. Wines are well chosen: we return to the New Zealand Babich Sauvignon Blanc several times. We are also treated to a wine tasting during our stay, which coincides with the traditional Movenpick ‘Chocolate Hour’. Do not come here to lose weight, although it is possible to have a very healthy breakfast. 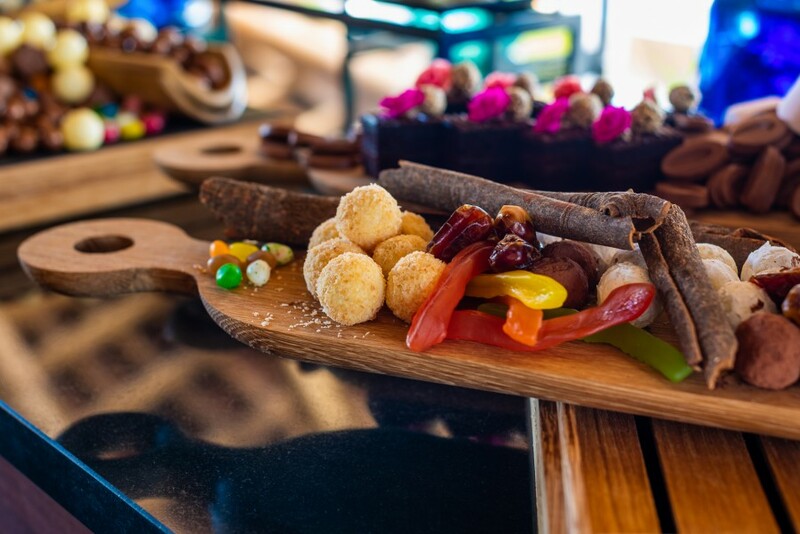 Breakfast is at ONU Marché, a large, elegant construction that serves locally sourced, nutritious Maldivian dishes along with a huge choice of continental breakfast treats. Intrigued, we also sign up for the ‘floating breakfast’ one morning: two staff come to our villa and prepare a tray full of food for us to enjoy from the comfort of our pool, with the tray bobbing along as we look into the sea: a memorable moment. If you’d rather get involved, try a cookery class: we learn how to make a local speciality, a tuna fish broth, which is then served to our table with paired wine. While most of the guests we see are couples who are quietly absorbed in each other, staff are very friendly. They’re also helpful, constantly topping up your water or offering you a lift in the buggies that drive between locations (you can also phone up and order one of these – useful if there’s a rare burst of rain). 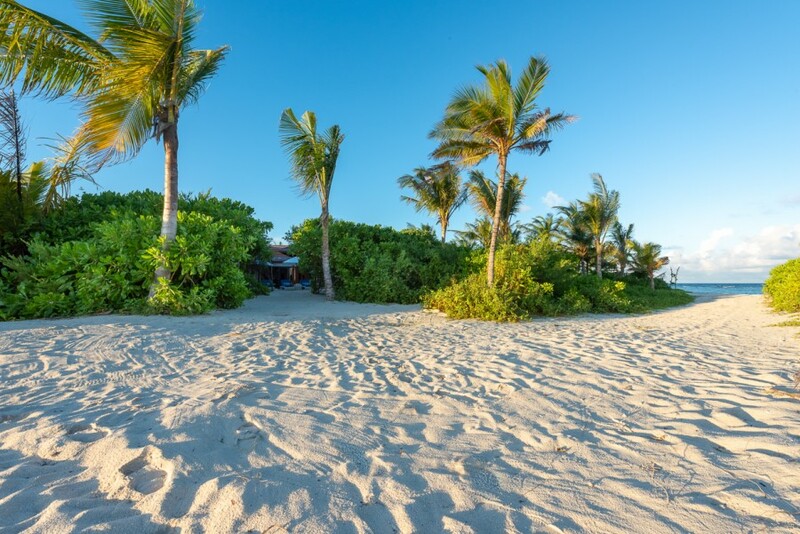 They’re keen to keep kids entertained, actively courting family business, and the Dive Centre folks are helpful and well placed for spotting dolphins on a lucky day. Meanwhile, the bar staff will mix you the cocktail of your choice alongside their signature drinks, including the Whisky Sidecar, Beet Lemonade, Cucumber Basil Fizz and Ocean Ocean. 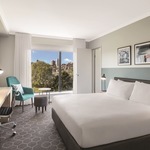 In its early stages, the Movenpick is especially eager for constructive feedback from its guests, but we have nothing to complain about and any bright ideas are taken on board quickly. 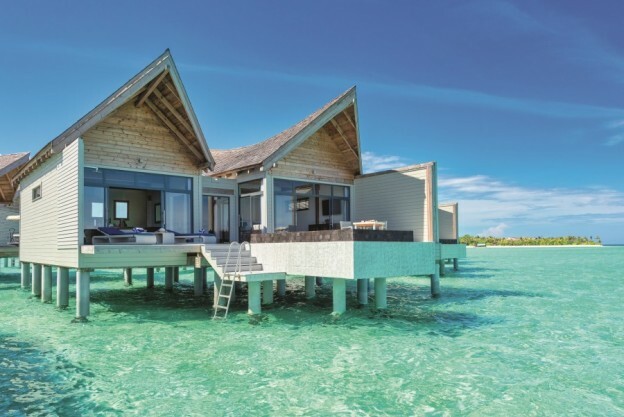 Already more efficient and luxurious than many a more established hotel, the Movenpick has got barefoot luxury covered and looks set to be one of the archipelago’s top choices for a romantic break. 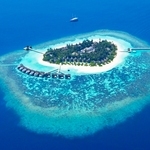 Mövenpick Resort Kuredhivaru Overwater Pool Villa Ocean from USD 840.60 per night excluding taxes (B&B). Beach Pool Suite family package from USD 849 per night for at least four nights, including couples’ massage, babysitting service and a family barbecue. 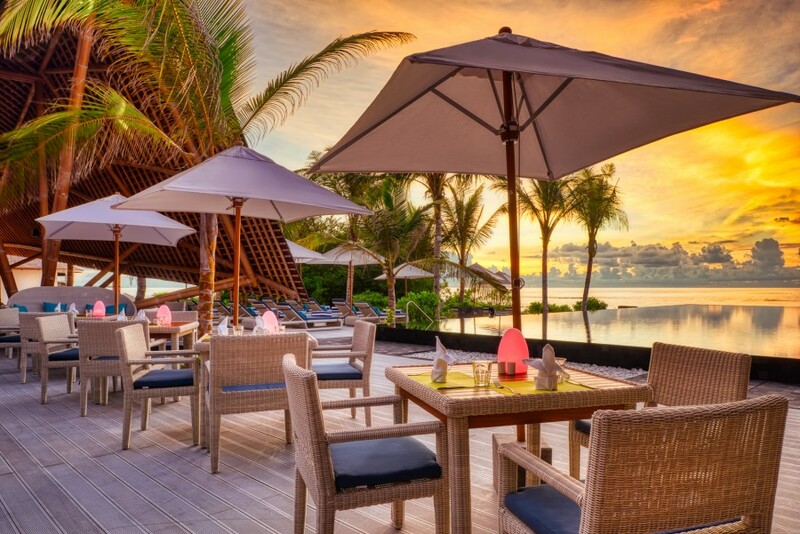 For more information and reservations, call +960 656 3000 or email resort.kuredhivaru.reservations@movenpick.com.